Here's why these three investors think you should take a look at ExxonMobil, EOG Resources, and Phillips 66 Partners. The oil and gas industry has been a strange market lately. 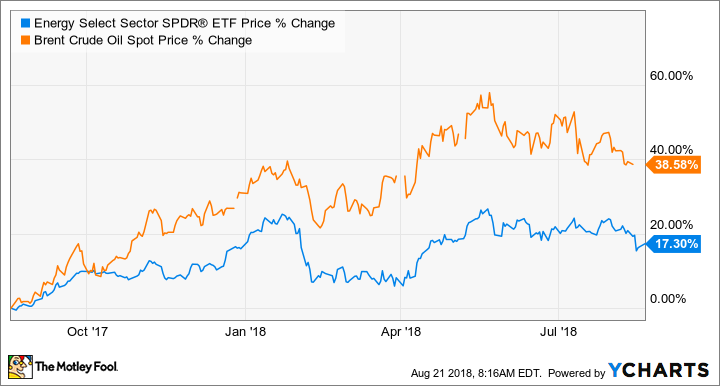 Even though the price of oil is up close to 40% over the past year, the Energy Select Sector SPDR ETF (NYSEMKT:XLE), which is comprised largely of oil and gas companies, is up just 17%. While a 17% return is impressive in its own right, it is still well below the gains of crude oil. While it's not a surefire sign that the industry is undervalued, it does suggest that those willing to sift through the industry could find some deals as oil hovers around $70 a barrel. 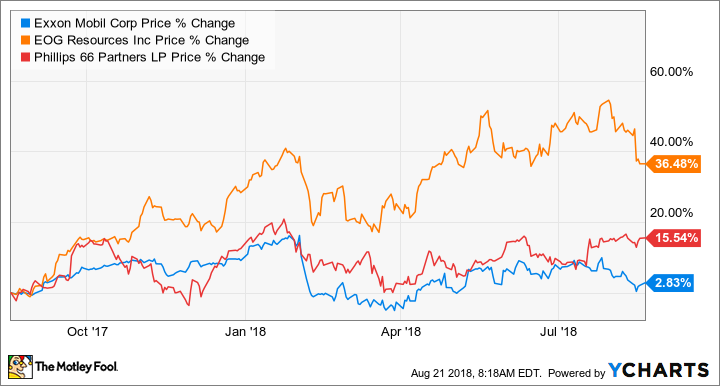 So we asked three of our Motley Fool contributors to each highlight a stock they see as a buy in the oil and gas industry right now. Here's why they picked ExxonMobil (NYSE:XOM), EOG Resources (NYSE:EOG), and Phillps 66 Partners (NYSE:PSXP). XLE price change. Data source: YCharts. Tyler Crowe (ExxonMobil): ExxonMobil has historically been one of the best in the oil business thanks to incredibly disciplined capital allocation. For decades, the market has assigned the company a premium to its peers because it has consistently produced higher rates of return. Recently, though, the company made a few decisions that have made investors question Exxon's reputation. Its 2010 acquisition of XTO Energy was probably an overpay for mostly shale gas assets and its involvement in extremely expensive projects like Kashagan in Kazakhstan and Gorgon LNG in Australia have lowered return rates. Even though the company has had a few missteps lately and its production rates tumbled as it scales back from these expensive endeavors, management's current plan shows a clear way forward. It has a suite of high-value projects set to go live between 2020 and 2025 that will add 1 million barrels per day of production and more than double its earnings by 2025, even if oil remains around $60 per barrel. Wall Street isn't that patient, though, and Exxon's stock is trading at its lowest valuation in decades. For those that can wait for management to implement this plan and suffer through what will likely be a series of underwhelming quarterly reports, now looks like a great time to buy shares of ExxonMobil. Matt DiLallo (EOG Resources): Shale giant EOG Resources proved once again why it's one of the best in the business during the second quarter. Not only did the oil producer continue to post strong production and earnings results but it unveiled three pleasant surprises. That's after the company provided investors with another big-time dividend increase as well as announcing that it made two new oil finds in the Powder River Basin while boosting its estimated recoverable resources from that play by tenfold. On the on hand, even with EOG's 19% dividend raise in the second quarter, the company still offers a paltry payout of less than 1%. However, it plans to deliver high-octane dividend growth in the coming years, which alone could fuel market-beating returns since dividend growth stocks have historically outperformed their stingier peers. Meanwhile, the discovery of two new high-return growth engines, which helped fuel a massive increase in its resource potential from that play, gives EOG Resources more fuel to continue growing production and earnings at a fast pace in the coming years. EOG Resources' focus on exploration-driven growth has been wildly successful over the years. In the last decade, shares are up more than 160%, which has outpaced the 130% return of the S&P 500. What's so impressive about that outperformance is that EOG beat the market even though oil prices have fallen more than 40%. With oil prices now on the upswing, and EOG running a well-oiled drilling machine, I think it can continue outperforming from here, which makes it one of the top oil stocks to consider buying this month. Oil stock price change over past year. Data source: YCharts. Jason Hall (Phillips 66 Partners): While shares of refining and petrochemicals giant Phillips 66 continue to march higher following its incredible second quarter, its midstream subsidiary and master limited partnership -- or MLP -- may be getting overlooked as a solid source of dependable income. At recent prices, Phillips 66 Partners units pay a dividend yield of 5.2% after a recent increase following a solid second quarter of its own. Amazingly, it has been able to bump the payout higher an incredible 19 consecutive quarters! Since going public in 2013, Phillips 66 Partners has increased its dividend an incredible 386%, better than 30% on a compounded annual rate. And while it's probably unrealistic to expect that level of dividend growth to continue, there is still a lot of growth in the offing. Phillips 66 is utilizing its MLP not just as a cash flow-generating tool, but also to develop assets to help connect its own refineries to lower-cost crude sources. This should result in more profitable refining for Phillips 66, and stronger cash flows for Phillips 66 partners from these new pipelines. With the need for a lot more pipelines and storage refineries connecting North American shale to the energy grid, Phillips 66 is in the right place at the right time. With one of North America's biggest refiners backing it, its prospects are even better. If it's dependable income from the oil patch with solid prospects for growth you're after, Phillips 66 Partners is buy-worthy today.